Nigerian mothers are awesome. They hold everything together and are saddled with the resonsibility of home making and food preparation. 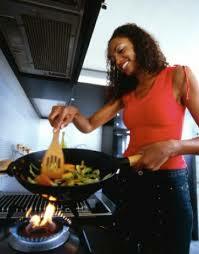 INFORMATION NIGERIA hereby bring to you 4 different foods Nigerian mothers cook often. Enjoy! Whether it is spiced with veggies, or not, Nigerian mothers cant but cook jollof rice. Trust to eat jollof rice whenever you are visiting Nigerian home. Its aroma makes it palatable and it is also easy to make. Nigerian mothers love to cook beans. This food is protein rich and trust our mothers to make varieties of foods from this food as well. Moimoi, akara are all good to go. Also, beans is not expensive and does not need extra cooking skills to cook it. Our Nigerian mothers from Ekiti, Ondo can relate to iyan (pounded yam) making, while those from the eastern part prefers eba, those from oyo like amala. These foods are usually served for dinners, combined with soups of choice. They are filling in nature. Most Nigerian mothers like making tea and pap. They are inexpensive and can be prepared easily. [Advice Needed] I Feel Uncomfortable Around My Boss, What Should I Do? Are You Pregnant? Then Quit Smoking!